Fact and opinion can be tricky. Fortunately, there are many great ways to teach this concept. Here is a list of nine of them (Editor’s Note: This list originally had 10 ideas, but one idea linked to a website that has since expired, making that suggestion useless). Read or display fact and opinion statements one at a time. Students hold up index cards with either “Fact” or “Opinion” on them to indicate which type of statement is being made. You could also use one card and write the words on each side. Label one side of the room “Fact” and the other side “Opinion.” Students are each given an index card with either a fact or an opinion written on it. Students read their card and go to the correct corner. Students are then given time to share their cards and see if others agree. Some may need to switch sides. Redistribute the cards and play again. This is a variation on the game above. Students write either a fact or an opinion on a piece of scrap paper. Then, they crumple them into balls and have a “snowball fight” for about 30 seconds (or as long as you can stand it). Kids each retrieve a snowball and then proceed as above to the appropriate part of the room. Get an inexpensive supermarket ball (the ones in the cages) or a beach ball. Write “Fact” and “Opinion” all over it with permanent marker. Students stand and throw the ball to each other. 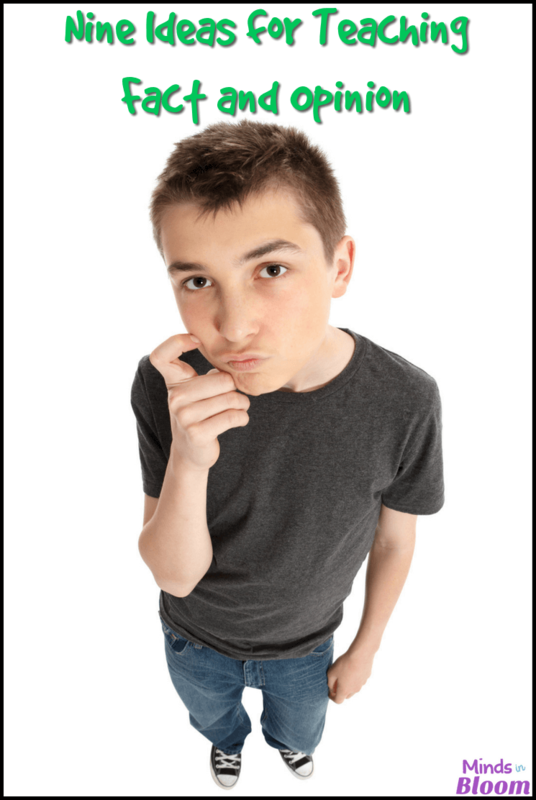 When a student catches the ball, he or she looks at which word is under (or closest to) his or her right thumb and makes that type of a statement. Then, he or she throws the ball to someone else. You could make this an elimination game for incorrect answers. Use individual white boards and play Fact and Opinion Scoot. Have students number their boards according to where they are sitting so that students can go from board to board in order. Next, have each student write either a fact or opinion on his or her board. Students number a piece of notebook paper to use as an answer sheet and scoot from desk to desk writing either “F” for fact or “O” for opinion. Check answers by having students who wrote each statement say what kind of a statement it is. Write a statement on the board and ask students to vote on whether it is a fact or an opinion, and then have students explain their reasoning. Write facts and opinions on color-coded index cards (different color for each type of statement). Distribute them and have students walk around the room sharing what is on each other’s cards. Then, have students split into groups by the color of their cards and explain why they are in these two groups. 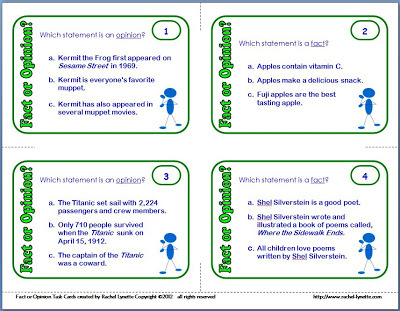 For individual practice or playing Scoot, you can use these Multiple Choice Fact and Opinion Task Cards. 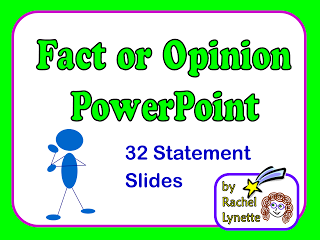 If task cards aren’t your thing, then you can get the same fact and opinion Statements in this PowerPoint. What do you do to teach fact and opinion? Please share with a comment. These ideas are very interesting. They will certainly pique and sustain my students’ interests. I will be using them with my class in the coming week. I also plan to share them with other educators.